As an English teacher at Q Language, I have the pleasure of teaching both local and international students who, for various reasons, have decided to study abroad in Hong Kong. Even after living in Hong Kong for over three years, I’m often surprised by the contrasts that are all around me here. I love living in a technologically advanced, cosmopolitan city. Hong Kong provides an abundance of options for shopping, dining, and going out in the evenings. But I also love traditional culture and, at the weekend, leaving the city behind – stretching my legs on a hiking trail, catching sun on a sandy beach, or visiting a traditional village. Hong Kong provides interesting bits of local heritage around almost every corner, and within an hour’s journey from the city center there are many beautiful and interesting sites. From these discussions, the students and I learn from each other about sales and shopping malls, restaurants and seasonal cuisine, and bars and nightclubs. We also compare notes on hiking trails, beaches, and tourist attractions. I often hear about groups of students going out exploring together, and sometimes we teachers take our classes to villages or scenic areas as class field trips. I love Victoria Harbour. I don’t think I could ever live in a city that wasn’t near the water. Looking from Kowloon across the Harbour at the famous Hong Kong skyline is truly amazing. But what makes the view surprising are the tiny Chinese fishing boats, called “Sampans”, out in the Harbour amongst gigantic cruise ships and high-speed hydrofoil ferries. Occasionally a traditional Chinese junk boat with its deep-red sails floats past the skyscrapers. In the city center itself there are many outdoor markets where vendors sell meat, seafood, fruits, vegetables, and flowers. If I want to buy my groceries, I can visit the big, modern supermarkets, or I can walk around the corner and haggle over the price of a live trout. There are also tailors, mahjong shops, and jade shops in some alleyways. They use big wooden boxes as storefronts and lock them up with padlocks at night. Just two blocks away could be a big bank headquarters or a Louis Vuitton shop. The contrast between rustic and ornate is striking! Recently I have been doing a lot of hiking. In autumn, the weather is good for hiking – no longer hot, but still sunny. Hong Kong has many, many hiking trails. Some of them are quite challenging, while some of them are easy. The views from the mountain ridges are stunning. From the Tai Tam Reservoir hike you can see all across Hong Kong Island. It feels so good to get away from the noise of the streets and busy buildings. It’s like having a vacation in three hours, and it really helps me feel refreshed for the upcoming workweek. Hong Kong has many traditional villages, some of them on small islands accessible only by ferry. 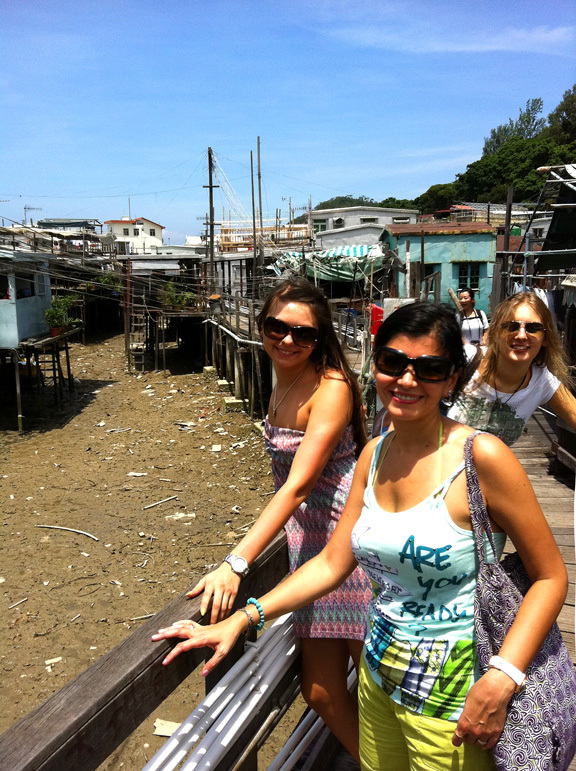 Last Monday my class and I visited Tai O fishing village on Lantau Island, which is built on stilts. A small touring boat showed us around the village and then out to a nearby Chinese White Dolphin habitat, where we photographed several wild dolphins from up close. It was very exciting to see the dolphins crest where we could get a clear view of their faces and pale-pink skin. In Hong Kong we have a perfect mixture of modern luxury, traditional charm, and natural beauty. I think these things can make a big difference to a foreign student’s experience. After an outing, I can see the difference in my students’ energy levels. The students who spend time exploring what Hong Kong has to offer come to class with more enthusiasm to study English. Getting some exercise and fresh air and seeing interesting places keeps us interested in what we’re doing – teaching and learning English. If you would like to study abroad in Hong Kong, take it from me, Hong Kong is a wonderful destination with so much to see and do – there really is something for everyone. If you enjoyed this post, please leave a comment below. Feel free to ask any questions or tell us about your experiences studying abroad. ← Are All English Courses The Same? Education is very important. One of the most important investment in life. 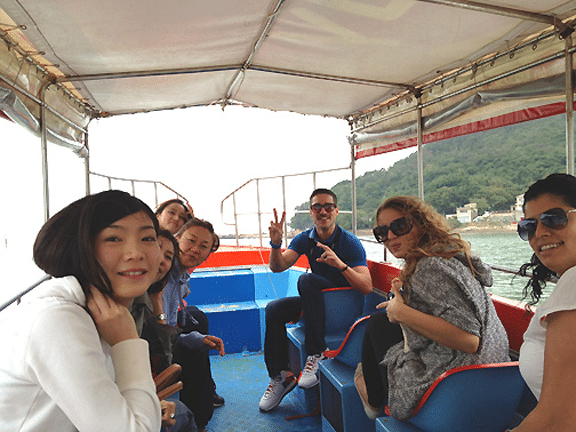 Hong Kong is a great destination to take English courses, specifically for Asian students. Obviously Q Language has better opportunities for those who want to take advantage of learning international languages. Hong Kong is a very advanced, progressive country. Studying here is sounds really interesting. A dream come true stepping stone.